I'm writing this post with one eye closed. It helps me to steady the screen. The past few days have poured over me like molten lead. As a Meniere's Disease sufferer, daily life will always be impacted - but, when stress peaks - look out! With the disease comes vertigo, severe and relentless attacks that can stretch from minutes to hours, and even into a string of dizzy days. Still, you work through it because Life doesn't "pause." Not much waits for Meniere's schedule. These past few days have been finalizing plans for the on-location filming and direction of crew. I have to say it is a HUGE blessing to have this crew. Eight simply amazing, wonderful folks, all ready to help bring Deconstructing Eden to life. 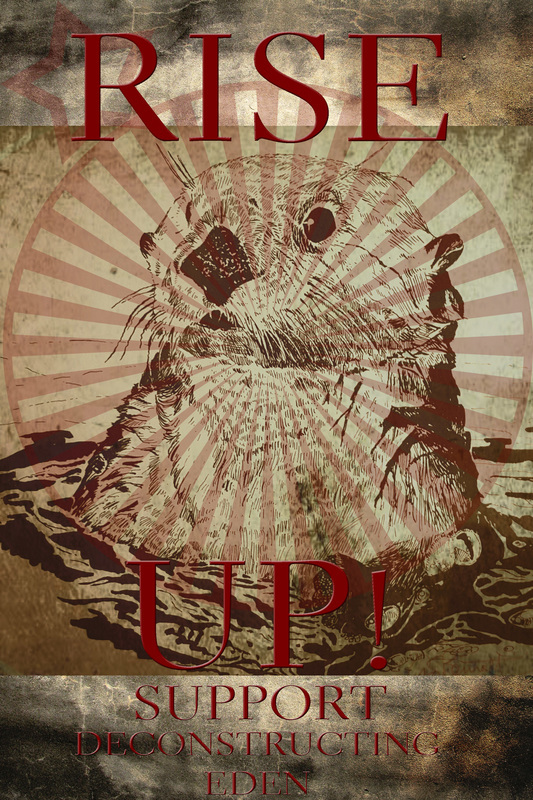 Without my "Otter Army," I would surely be lost. One week. That's it, then the camera rolls... the story alights. As troubled as I am with vertigo, I still cannot measure my excitement! "A crew, by definition, is a team. Although I may lead this team, I am not, nor would I be capable of being, the “star” of this team. There will be several “pep talks” in the weeks ahead. This is the first, and somewhat the most important. I've just returned from a trip to Canada where I had the amazing opportunity and honor to meet and talk with Dr, Jane Goodall. I was invited to meet her by one of her family members, for whom (at the time without fully knowing the connection to Jane) I dropped an entire day off of a very packed schedule for this film's research trip in October to help with a medical crisis in San Francisco. To me, she was simply a friend in need. I was an invited VIP and not only had a ticket to the event but also access to a meet and greet before the lecture and a private meeting after it. During the meet and greet she spoke candidly with the 70 of us gathered in a special gallery area of the theater. She talked mainly about how important it was for her to have an opportunity to speak to supporters of the JGI Roots and Shoots Program. She also thanked the city officials and Mr. Robert Bateman (renowned wildlife artist and conservation advocate) for being there. After a short speech, Dr. Jane (she does not like being called Dr. Goodall, as it's too formal for her tastes) mingled and made her way through the crowd. Then she stopped at me and smiled. I took it as an invitation to introduce myself. I told her my name, and instantly she stopped me in mid-sentence. I think I said “Yes,” then rambled and gushed incoherently for the next minute. She tapped my shirt, which had a picture of an otter on it, and said I look forward to talking with you more later. Her lecture was phenomenal. It was my second time at one of her lectures. This lecture she spoke of the Seeds of Hope, which focuses not on the dire aspects of the decay of our natural world but on the meaningful progress being made to restore the balance. Our film – Deconstructing Eden – will be a part of that mission. We are tasked with bringing hope back to the table, and making people want to help rather than simply curl up into a ball, and shutdown. We hold in our hands, hearts and creative minds the task and responsibility of inspiring people and educating the world – nothing less – and, we WILL accomplish that mission. After the lecture I was brought to the area where she would soon be signing books. The lines was already more than 500 people long. I admit I felt awkward being ushered in front of so many people. I know there were folks there for whom they scraped together pocket change in order to see Dr. Jane...to just be in her presence. I am no one special in comparison to the people in that line. I'm not more important, nor more worthy of Dr. Jane's time and attention. Still, there I was, being given a few minutes to chat with her before she started signing books. When she saw me her face brightened again and as she took my hand, I pulled her into a hug. I gave her a gentle squeeze. This time I was far more composed. That was not lost on me. She remembered my name from a 30-second meeting, more than two hours earlier. She then touched the otter on my shirt and told me she talks about the southern sea otters in a few of her books. That's the moment you see here. 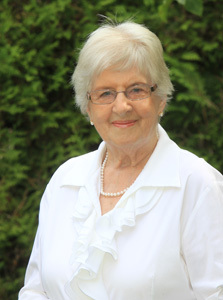 Dr. Jane wished me – all of us, really – good luck with the film. I'll leave you with that for now. Consider that moment our official launch sendoff. 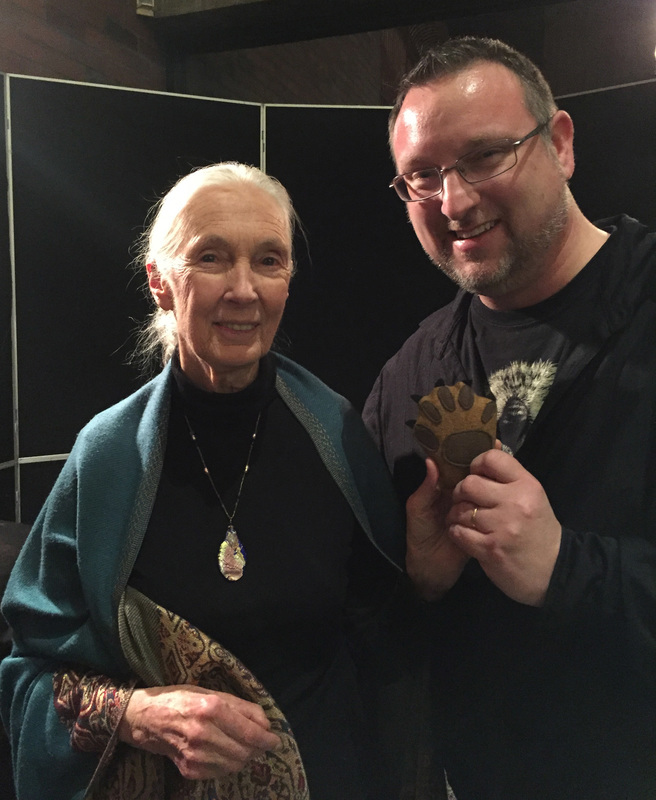 Dr. Jane Goodall goes "Paws Up!" for sea otters! I can't believe it... 38 days until filming starts!!! It's been almost a year of prep, Scouting locations, research, script writing, fund raising, gaining sponsors, paperwork and finding crew have all been more enjoyable than pre-production should ever be. I mean that quite earnestly. Things came together in humbling, amazing and wonderful ways unlike any production of mine before. Two things I'd like to talk about in this post: Methodology and Creative Vision. Methodology is very important to put out there right now. Above all else in making these films is adhering to regulations and treating wildlife with respect. That's the central guide for this film, too. I can't tell you what I plan to film (exactly), nor will divulge the script, but I can tell you “how” footage will be acquired. 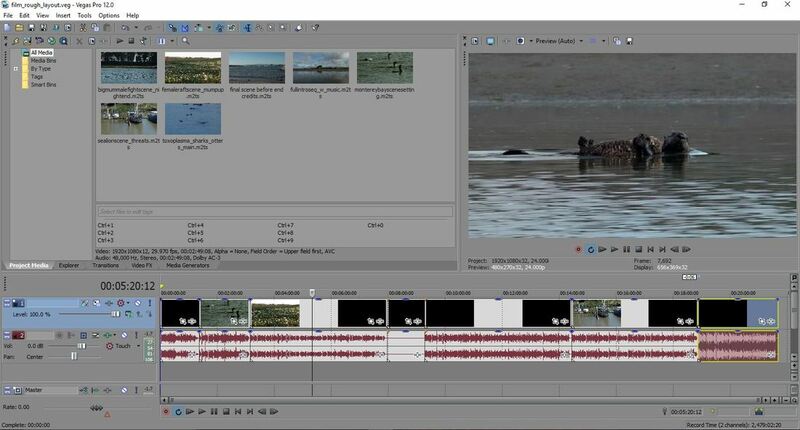 A very large percentage of the footage – both surface and underwater – will be done from shore and with the cameras set up quite a distance from the animal subjects. That may sound counter intuitive to getting decent shots, but because I have scouted safe locations with physical barriers between the wildlife and myself (and crew) I will still have many, many opportunities to film passing animals – without affecting their behaviors or being an obstruction to their movement. We do not enter the water to film... ever. No divers, not even kayaks to film the movie. I did kayak the slough (without filming) during my research. That was critical for me to get a feel for the estuary and the ecosystem the otters live in. 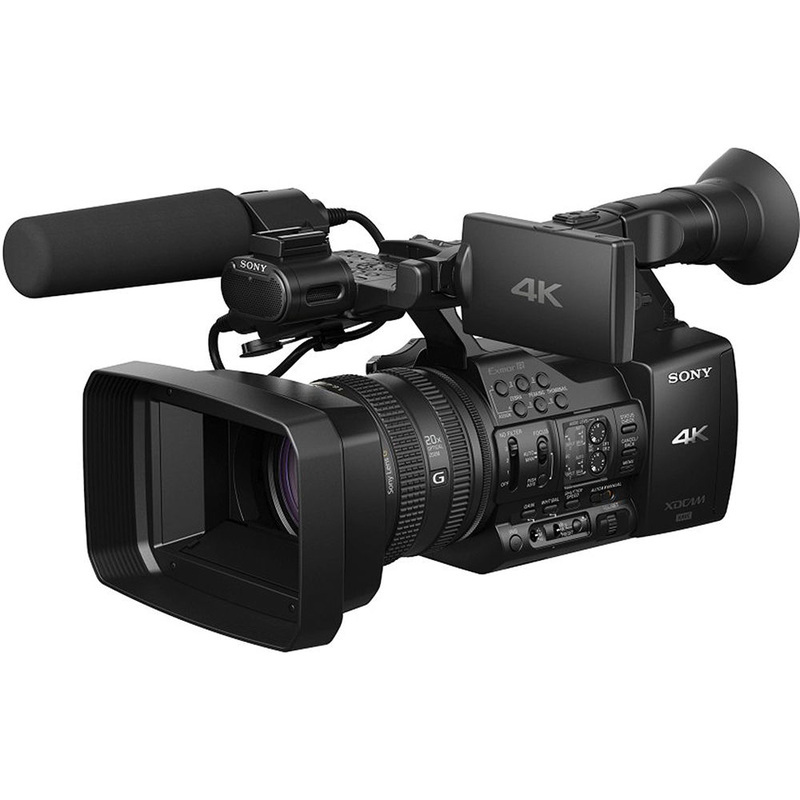 Our underwater footage will be shot via an 18-foot-long pole, with a 4K underwater camera attached, affixed to a static shore point or hand steadied on the jetty, near the ocean inlet. Here again, we'll hug the shore (up and away from the water's surface) and simply be “flies on the wall” as animals pass by. In saying that, sea lions are very curious, as are the sea otters, and there will be times when they will swim near the pole just to check it out. The pole camera is neither designed to follow them, nor would I allow that. It is pressed up against the dock or rocks – out of the path of any wildlife. If they linger, or attempt an approach to touch the camera, it will be pulled up and out of their reach until they move on. Neither human being nor marine mammals will ever be close to making contact. The dock I film on actually has a fence in place to assure there won't even be accidental contact. I do nothing to attract wildlife. Whatever happens to be the behavior they are doing naturally is simply filmed as it happens. The script is very forgiving that way, I don't need the manufactured actions – only the natural ones. As for the surface camera, pictured below, it has enough telephoto zoom capabilities to keep me at legal and safe distance from the marine mammals, while still getting “close” footage. The law, but more importantly the safety and stress of the animals trumps EVERYTHING. Period. That brings me to the creative process. 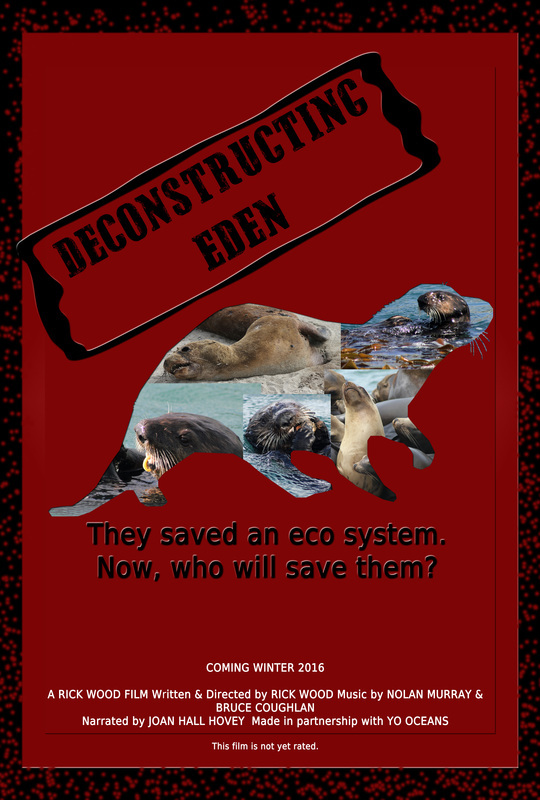 Deconstructing Eden is the story of an ecosystem first and foremost. It has many living parts. All of those parts combine to tell a story. There is inherent drama to this story. There's struggle: life and death. Telling this story happens three ways. The first is visual; I want you to see the environment... “feel” the home of the sea otters. Next is through the spoken words. The script is written to not only be educational, but also inspiring and hopeful. Both of those are rounded out with music. The scoring is critical, as it will tell the story without words...sometimes, for those who are sight impaired, without images, too. It all comes together through the collaboration and hard work of scores of people. People in California, Washington, various other states, and Canada. 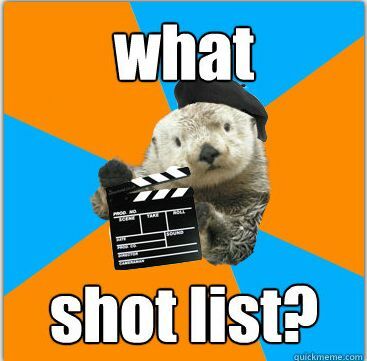 When I slate the first shot on-location, I will have a team of four production assistants, a production coordinator, still photographer, and a local marine biologist consultant. Our “raft” of crew will turn these ideas into film artistry. Thirty-eight days. I can't wait!